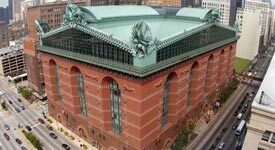 We’re just around the corner from Chicago, so we’re thrilled to hear that The Harold Washington Library Center is giving free access to its Innovation Lab. The lab has three Makerbot 3-D printers, laser CNCs and even a milling machine. This is a great opportunity for makers, hackers, teachers, students and, well, everyone. We truly believe that open access to this kind of technology will enable and inspire makers to build more and more amazing things. The future is looking bright, better print up some sunglasses!